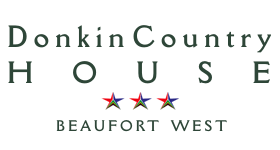 Donkin Country House is a guest house with affordable accommodation in Beaufort West, situated in the heart of the Great Karoo, Western Cape, South Africa. For overnight accommodation in Beaufort West, or bed and breakfast accommodation on the N1, look no further! Most rooms are self-catering accommodation. Best B&B accommodation in Beaufort West. © Donkin Country House 2016. All Rights Reserved. Hosting by Gardenroute.com. Site Development by HandMade Connections.